Translate the Find.Same.Images.OK in my Language! Is easy to switch the language in Find.Same.Images.OK to your country language. The Find.Same.Images.OK using the string list from Q-Dir! Please use always ► ...the latest version of Find.Same.Images.OK for Windows! 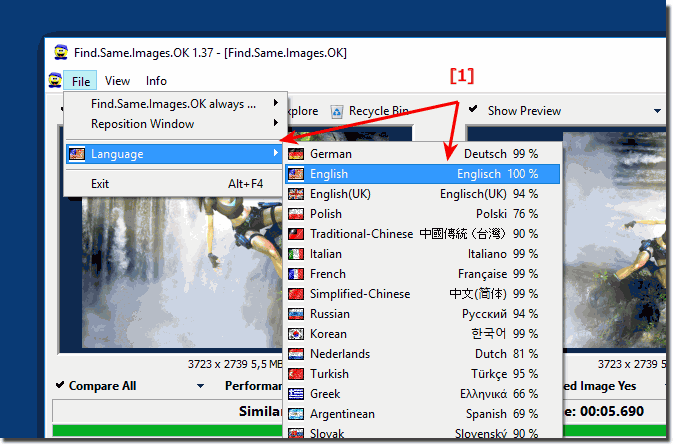 Find.Same.Images.OK - FAQ-1: Translate the Find.Same.Images.OK in my Language! I found thousands of photos, how could I select all? In the free tool Find.Same.Images.OK yo can select between Quality and Performance balanced and Performance balanced or Quality balanced. Difference between Quality and Performance in FindSameImagesOK? The Find.Same.Images.OK will create the Image signatures ergo thumbnails of Images. And then compare it if necessary. Based on you personal search settings.